Havana, Cuba is like no other place I have ever been, which may be one of the reasons I keep going back. I have visited the city four times now, staying for a cumulative total of a month and a half, most of that time spent in Havana Vieja (Old Havana), a vibrant part of the city so historically and culturally rich that it has been granted UNESCO World Heritage status by the United Nations. With each subsequent visit to Havana, I have become a little more familiar with the area and better able to recognize and appreciate the rich ingredients that make this wonderfully unique place the city that it is. In this assignment I have attempted to show some of the character of Havana Vieja and of the people who live there - the rich colours, the unique landscapes, the irrepressible spirit of the people. One of the most important and prominent of those ingredients is music. Except for during the very early morning hours -- when the only sounds in the city are the occasional car, or the ticking of a dog's paws as a stray trots by, or the low tones of conversation between people still waking up -- there is the constant sound of music in Havana Vieja. Whether it is coming from the open doorways of a bar where a salsa band is playing, or an apartment where a group is rehearsing, or a radio in someone's kitchen from where the song of a heartbreak sung in Spanish echoes out into the street, or someone else singing unseen in the warm darkness of the poorly lit city, late at night, there is always the sound of song in Havana Vieja. As soon as one walks beyond the sound of one source of music, another will become audible ahead, as if the very heartbeat of Havana were made up of the thousands of melodies and rhythms that emanate from the people and coalesce into the beautiful cacophony of the streets. 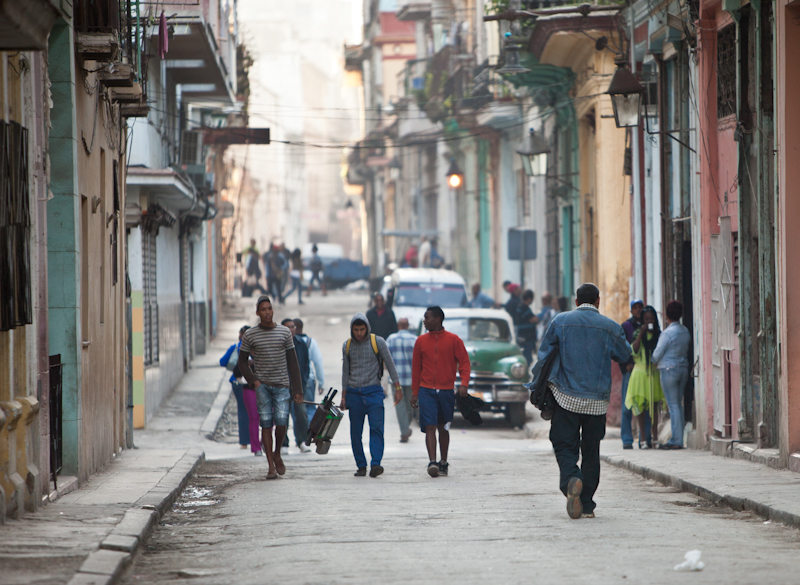 What makes Havana what it is? It is made of crumbling colonial buildings in faded paint that are still lived in, with lines full of clean laundry hanging between the pillars, and families packed into immaculately clean front rooms, lit by the harsh light of low-wattage bulbs. It is stray dogs, often mangy, or missing limbs or eyes, who trot through the streets with some unknown purpose, as if they have somewhere very important to go. The smell of dog poo is an essential ingredient in the miasma that makes up the smells of Havana, and part of what makes Havana what it is, is the unique perfume of the city. While much of the aroma of the street can be unpleasant, sometimes surprisingly so when one walks past a cluster of bins that haven't had their leaking cargo of rotting meat and vegetables emptied for a week, there are other smells that perfume the tropical air of the city. There are the smells of cigars of course, and sometimes the smell of the sea when the breeze is right, and the aroma of things frying, plantains and potatoes and chicken, and through it all is laced the thick fume of exhaust from the thousands of classic American cars that make up such a large percentage of Cuban traffic. More than anything it is the people themselves, the “Habaneros” who I think define the character of the city. They live in grinding poverty, but it is universal and shared by all, and this gives them a sense of pride in self and a belief in the greater good of community that is apparent even on one's first visit to Havana. The pride in self that the Cubans have is evident in the immaculately clean clothes worn by both men and women alike, and the way that their stride makes both genders look as if they own the entire world when they walk down the street. Their sense of community is obvious when one notices that no car has fewer than four passengers, motorcycles almost always have side-cars in order to take as many people as possible on any journey, and if someone on the street is trying to do something difficult, such as raising a heavy industrial light fixture using an unbelievably dangerous-looking series of chains and pulleys, there will be a dozen volunteers that materialize from everywhere around to advise and confer and to lend their back to the task. Havana is safe, but looks very dangerous with its fierce-looking people and its poorly lit streets. 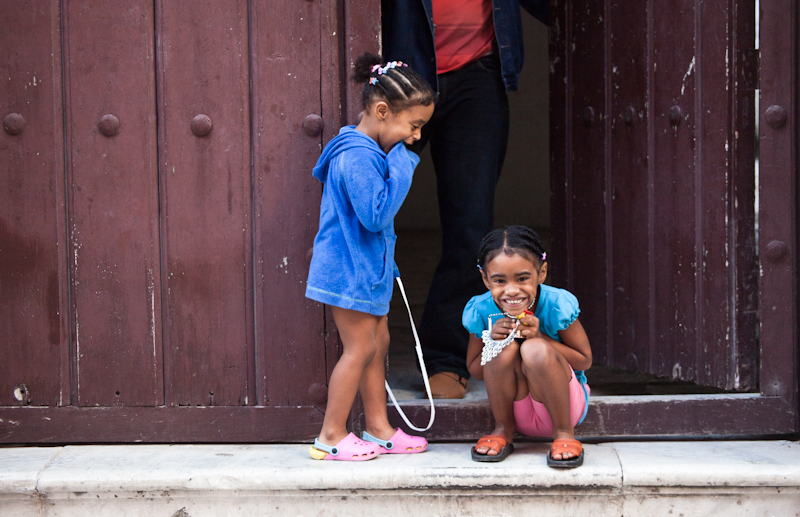 Havana is children that are beloved by the community and aren't afraid to play in the streets. 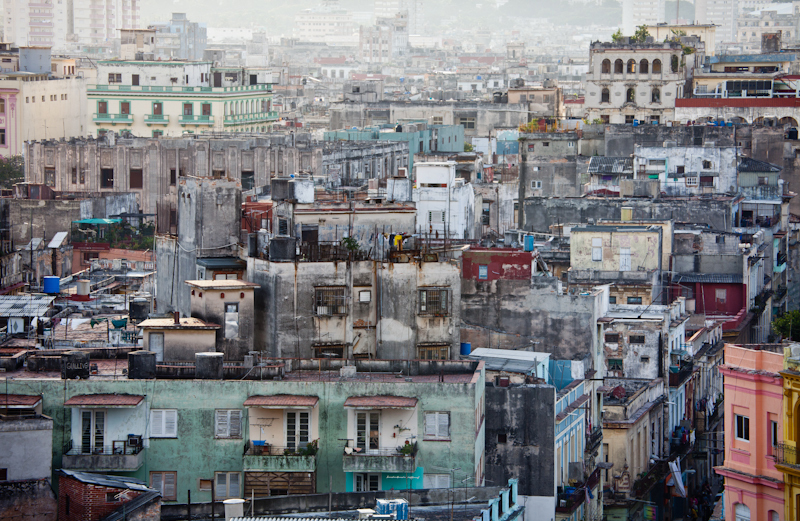 Havana is poverty of material goods and wealth of human strength and kindness living side by side. Havana is shortages and people who don't speak English who have an enormous amount of idle time but who always seem to be looking to find a way to make their lives better, together. Havana is hot and cold and smoky and dirty and friendly and cut off from much of the rest of the world and utterly beautiful, and slowly by slowly, poco y poco, Havana is changing. There is such diversity that it is hard to capture all facets of the character of the city. I feel that these twelve images succeed in showing some of the real Havana, avoiding the tourist office clichés. My main regret is that I did not manage to get an image which successfully shows one of the squares. There are a few more taken from rooftops but I didn’t want the set to see too voyeuristic. Although we have always found the city to be very safe, we have received advice to avoid certain areas especially while carrying expensive camera equipment. This is something I aim to be braver about next time I visit as I am sure there is some great ‘Street’ to be had on the peripheries of the old town or in Centro . I will also be taking a tripod as Havana at night is visually stunning and I would like to capture that properly. In hindsight, I probably should also have spent more time inside buildings – we have tended to avoid the touristy places, museums etc but I am sure there would be some fantastic photographic opportunities in some of the interiors. I found the combination of bright Caribbean light and narrow dark streets quite challenging and sometimes resorted to using Automatic settings to try to snag the best street shots. 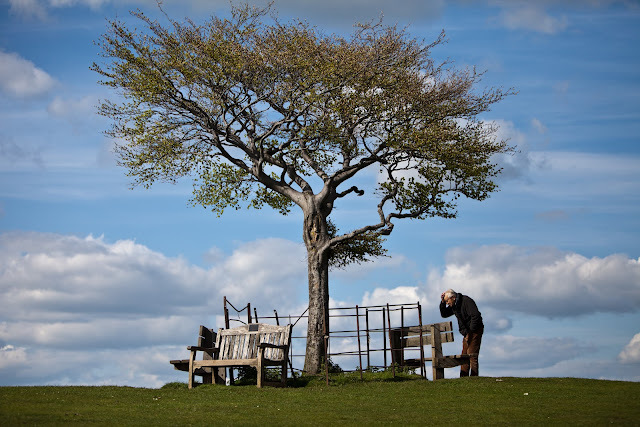 I would like to think that I would have approached this in the same way even if I had been taking photographs with no clear end-result in mind. Good vacation photography should aim to show the character of a place and its people even with no expectations for the work to be published. One of the first things that struck me when I arrived in Havana is that there is always something going on, everywhere you look. All the Habaneros seem to have a real sense of purpose – even the dogs. 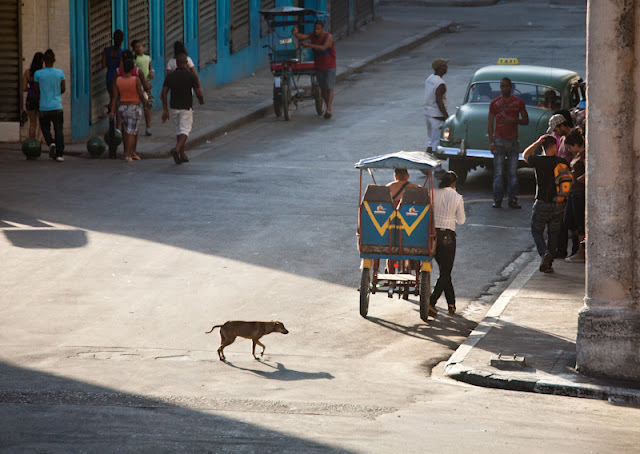 This image includes three iconic Cuban sights: a classic American car, pedicabs and a stray dog in the middle of the road. Along with all the pedestrian activity, I think this really conveys a sense of the character of the urban landscape. 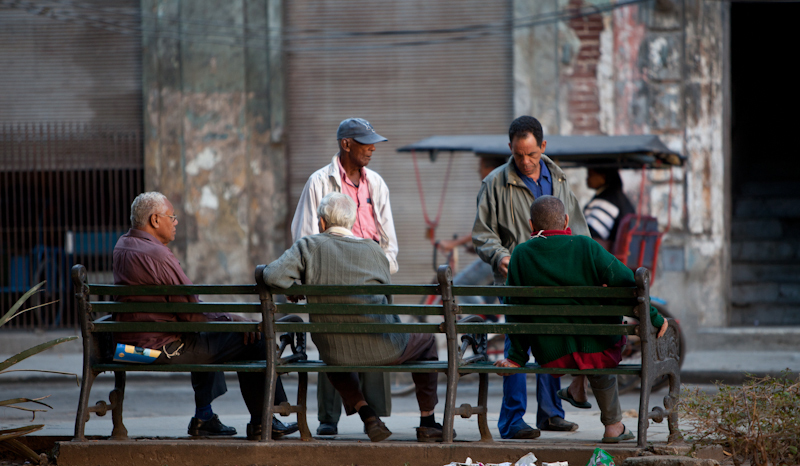 In and amongst the hubbub, Cubans always find time to sit around and socialise. Without the usual Western distractions of modern life and with very limited access to reading material or cash for the bars, sitting in the street watching or talking in groups is a huge part of the culture in Havana. I feel this image captures some sense of the widespread poverty in the city while showing the dignity of its inhabitants. I am also rather intrigued by what the man in blue might be holding in his hand and what the relationship is between these people. 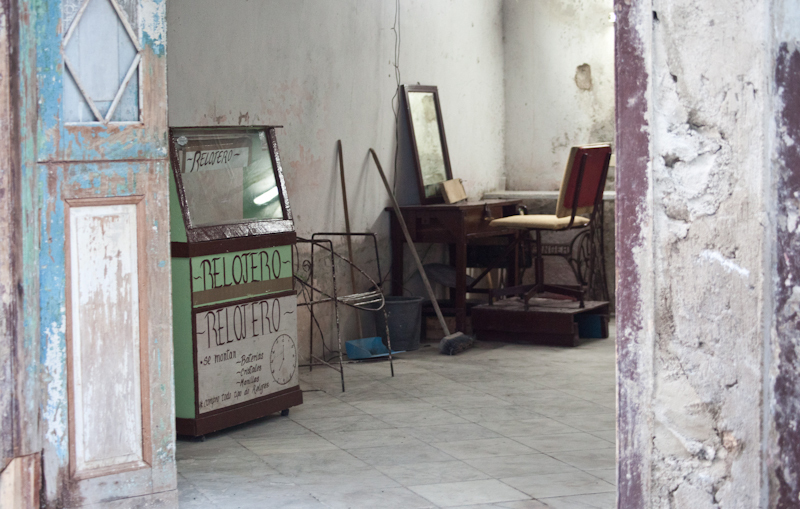 There are very few of what we would consider to be “normal” shops in Cuba. Most outlets are still controlled by the state and food is rationed. 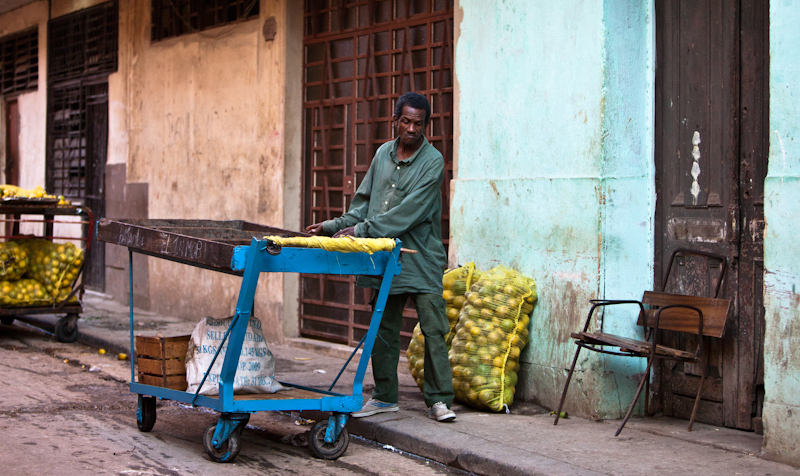 Outside of this system, fruit and vegetables are sometimes available on small trolleys parked in the street at certain times of day and usually just selling one type of produce. This image shows how the street vendors are an intrinsic part of the scenery on the streets of Habana Vieja and how very basic the shopping “experience” can be. Walking up and down the streets of the old town, one passes dozens of seemingly empty open rooms, which are actually shop fronts. This view reveals the small homemade watchmaker’s cabinet and also an intriguing set up with a chair and mirror presumably for haircutting. For me this scene really evokes the communist austerity in Cuba – the muted colours, harsh strip lighting, bare walls, immaculately swept floors, all framed by a disintegrating exterior. As is so often the case, there are random pieces of furniture in sight. Nothing is wasted in Cuba – everything will be recycled, repurposed or at least stored for some future adaptation. A common sight on the narrow streets of the old town is of individual labourers helping the street vendors or performing tasks for the state run stores. This gentleman was bagging up lemons, using the most basic of equipment, including a very rickety cart. His expression captures the rigour (and mundanity?) of the work and indicates the very primitive level of industry in which many Cubans are engaged. We also saw many chairs like this one, which looked as if they would collapse instantly should someone try to use them. Habana Vieja streets are quite narrow with low levels of traffic and with much of daily life occurring outdoors, children play happily everywhere. There is a great sense of community and reliance on extended family members and neighbours to keep an eye on the kids. I wanted to capture the open friendliness of the children in the streets – they love having their photo taken (although the savvy ones sometimes ask for a peso in return). The adults often seem oblivious to the tourists taking pics and certainly don’t mind their children being snapped. We carry biros to give the children as these can be scarce in the city. It is easy to overly-romanticise the socialist idyll but the kids in Havana genuinely seem joyful and relaxed as well as being educated and well-behaved. With space at such a premium in this over-crowded city, the Cubans use up every square foot. 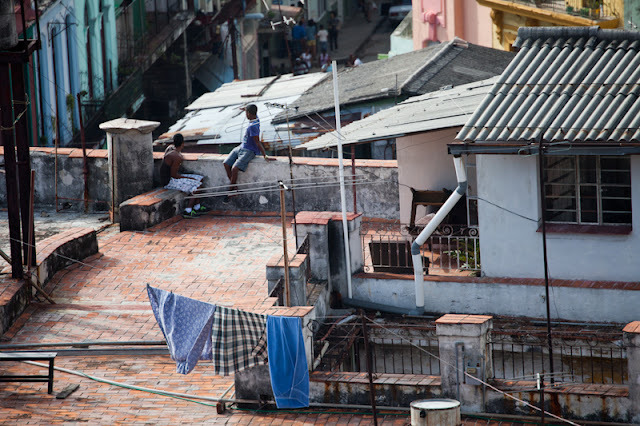 This image shows a little of life on the rooftops of Havana – the shacks, the laundry lines, the vantage points for the national hobby of people-watching. It is difficult to capture views across the city that really do justice to what one can see with the naked eye but I hope this image gives a sense of the colours, the state of disrepair of many of the buildings, signs of life in every nook and cranny. Habaneros are very proud of their city and are delighted to hear tourists say that they love it too and I am always glad that I can honestly say that I find scenes like this breathtaking and beautiful. The most unique thing about Cuba is the ubiquity of classic American cars. Although the ratio is now changing rapidly, a few years ago about 70% of the cars on the road were pre-revolution. As well as looking so picturesque for tourists, these cars hold a lot of people, which ties in perfectly with the ethos of helping out the neighbours and sharing the costs whenever possible. You rarely see a car that isn’t packed with people and even the motorbikes have sidecars. 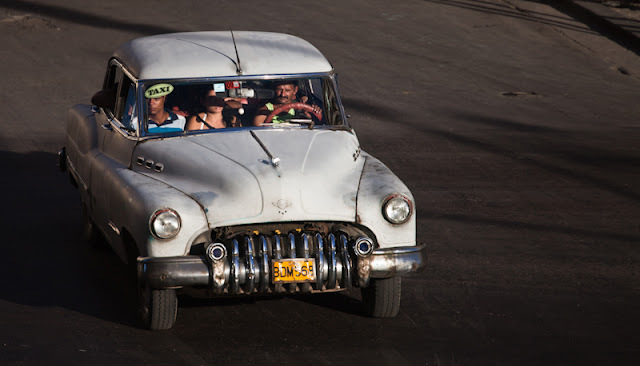 This image shows (what I am told is) a 1950 Buick, in all its glory, being used as a state-sponsored taxi for locals. I wanted to include one of these cars in the set but without it being too clichéd – hence the slightly unusual elevated viewpoint and the choice of a ‘working’ vehicle rather than a showpiece. To me, the driver and passengers look strong and spirited, even in what must be quite unpleasant travelling conditions. 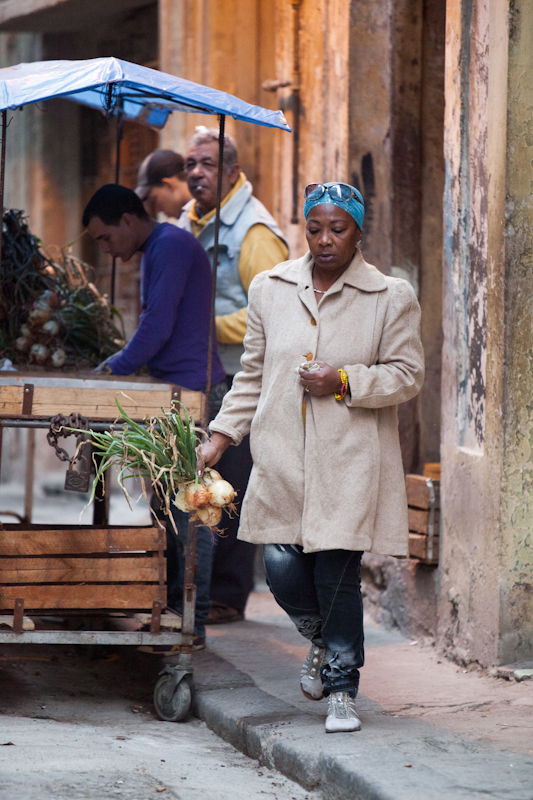 This image captures so much of the essence of the off-the-beaten-track of Habana Vieja for me. It shows the stunning light, pockets of activity on the street, the bright colours of the buildings, the balconies, the dangerous-looking wiring set-ups, laundry, the lanterns, lads carrying unidentifiable machinery parts… In reality, most road surfaces are much more pot-holed than this and usually riddled with suspiciously opaque puddles and a disconcerting amount of dog mess! Habaneros lean over their balconies or stand by walls or sit on their doorsteps for hours on end just watching the world go by – greeting neighbours, chatting with tourists, petting their dogs, smoking, reading Granma, but mainly just staring. They often look fierce but if you wave they will grin and shout “Hola!”. 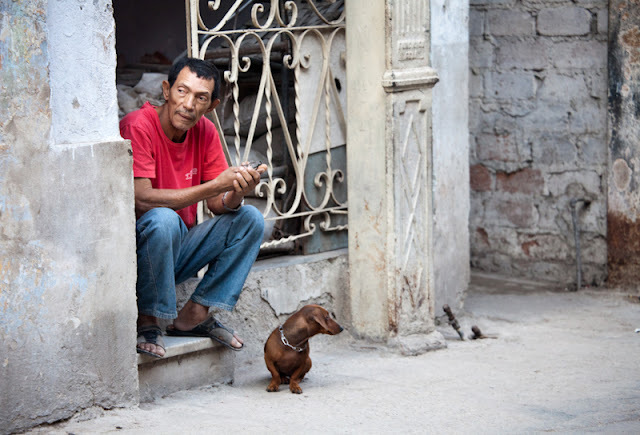 This image captures that pass-time for me – down to the detail of the man’s dachshund - the breed that is most popular in Havana at the moment. He is sitting on the stoop of his home, not a building site as it may seem. I really feel that this scene adds another dimension to this set of images depicting the character of Havana and its citizens. It was shot on Obispo, the main pedestrian street of Vieja. 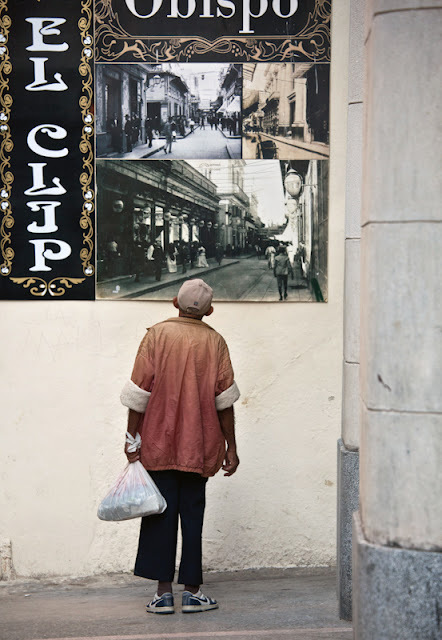 The permanent billboard advertising El Clip – a watch shop - shows some old photographs of the street as it was many decades ago. What is the man remembering as he stares at these pictures? It seems like there is something very intense about the connection between him and the photographs, even though we cannot see the expression on his face, and I find this image to be very moving. There is something so still, so innocent and trusting about his stance and yet he has lived through so many horrendous periods in Cuban history and has had such little control over his destiny. What will future decades bring for this beautiful country and its people?